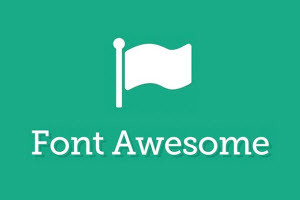 FontAwesome has become extremely popular and useful over the last few years. I’m getting more and more questions from clients and others in the Flare community about how to use FontAwesome in MadCap Flare projects. This article helps get you started. FontAwesome is a collection of scalable vector icons and graphics that can be styled with CSS. There are hundreds of vector icons available (take a look). Because they are vector, you can scale them to any size that you need without losing any of that crisp fidelity that we all like in graphics. FontAwesome also saves you from having to load a bunch of .png icon files into you Flare project, especially if you need different color icons for hover effects. I’ve used FontAwesome in a number of different ways in Flare projects recently. Follow these steps to start using FontAwesome in your Flare Project. If you’re going to be using FontAwesome icons on most or all pages of your HTML output (like in a footer), then add your embed code to your MasterPage. If you’ll be using it only on a few topics in your project, you’ll probably want to use the embed code only on those pages (although you can put it in the MasterPage if you want). You add FontAwesome icons to your topics, MasterPages, and snippets using an <i>tag with the associated class for the icon you want to use. For example, if you wanted to use the GitHub icon in your project, you would first go to the FontAwesome icon page at http://fontawesome.io/icons/ and search for GitHub. On that page, click the specific GitHub icon you want to use. From the page that opens, copy the <i> element that is shown. In this example, it is <i class="fa fa-github" aria-hidden="true"></i>. Now that you have the <i> code that you need, you can paste that in your Flare MasterPage, topic, or snippet using the Text Editor in Flare. There are a lot of examples on the FontAwesome website on how you can use more specific style classes to get exactly the icon behavior you’re looking for. See http://fontawesome.io/examples/. There is a way to insert FontAwesome icons using just CSS in Flare, but I’m going to post those instructions in another blog post to keep this post from getting too long. Stay tuned! Using FontAwesome in your Flare project does take a little work, and it requires you to get down into the code of your project files. But once you understand how it works and how to insert them into your project, it runs very smoothly and quickly. I personally find it a lot easier to manage icons using FontAwesome than I do using a bunch of .png files.